In this course, students study a wide range of literary and non-literary texts in a variety of media. By examining communicative acts across literary form and textual type alongside appropriate secondary readings, students will investigate the nature of language itself and the ways in which it shapes and is influenced by identity and culture. Approaches to study in the course are meant to be wide ranging and can include literary theory, sociolinguistics, media studies and critical discourse analysis among others. 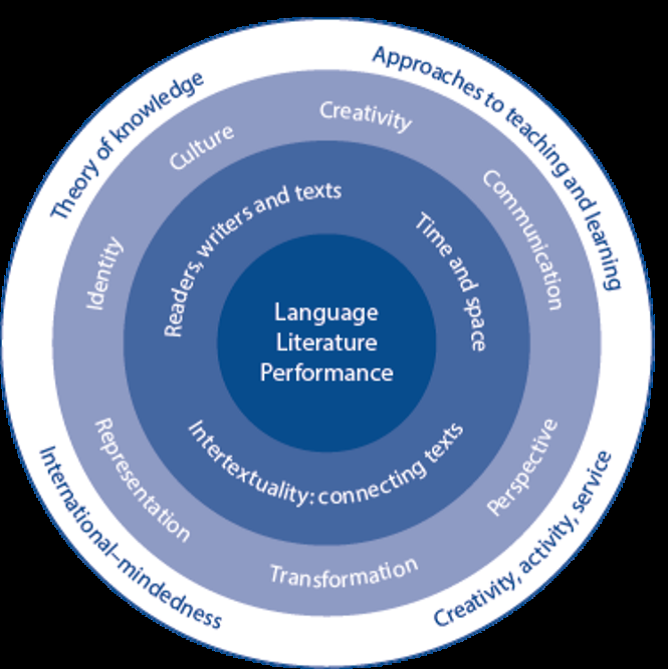 The model for language A: language and literature is the same at SL and HL but there are significant quantitative and qualitative differences between the levels. SL students are required to study four literary works and a number of non-literary texts that is equivalent in teaching and learning time, whereas HL students are required to study six literary works and a number of non-literary texts that is equivalent in teaching and learning time. In paper 1, both SL and HL students are presented with two previously unseen non-literary extracts or texts from different text types, each accompanied by a guiding question. SL students are required to write a guided analysis of one of these, while HL students must write guided analyses of both non-literary extracts or texts. In addition, HL students will have a fourth assessment component, the higher level (HL) essay, a written coursework task that requires students to explore a line of inquiry in relation to a studied non-literary text or texts, or a literary text or work. The outcome of this exploration is a 1200-1500 word essay in which HL students are expected to demonstrate a deeper understanding of the nature of linguistic or literary study. foster a lifelong interest in and enjoyment of language and literature. features of particular text types and literary forms. ways in which texts may offer perspectives on human concerns. In the language A: language and literature course students will learn about the complex and dynamic nature of language and explore both its practical and aesthetic dimensions. They will explore the crucial role language plays in communication, reflecting experience and shaping the world. Students will also learn about their own roles as producers of language and develop their productive skills. Throughout the course, students will explore the various ways in which language choices, text types, literary forms and contextual elements all effect meaning. Through close analysis of various text types and literary forms, students will consider their own interpretations, as well as the critical perspectives of others, to explore how such positions are shaped by cultural belief systems and to negotiate meanings for texts. Students will engage in activities that involve them in the process of production and help shape their critical awareness of how texts and their associated visual and audio elements work together to influence the audience/reader and how audiences/readers open up the possibilities of texts. With its focus on a wide variety of communicative acts, the course is meant to develop sensitivity to the foundational nature, and pervasive influence, of language in the world at large. The learner portfolio is a central element of the language A: language and literature course, and is mandatory for all students. It is an individual collection of student work done throughout the two years of the course. The work carried out for the learner portfolio forms the basis of preparation for the assessment, although the portfolio itself will not be directly assessed or moderated by the IB. However, it is a fundamental element of the course, providing evidence of the student’s work and a reflection of their preparation for the assessment components. Schools may be required to submit these learner portfolios in cases in which it is necessary to determine the authenticity of student’s work in a component, to certify that the principles of academic honesty have been respected or to evaluate the implementation of the syllabus in a school. the world at large. This component consists of an individual oral which is internally assessed by the teacher and externally moderated by the IB at the end of the course. The essay must be 1,200-1,500 words in length. Examine the ways in which the global issue of your choice is presented through the content and form of two of the texts that you have studied (40 marks).